UPDATE: On February 15, 2013, Blade was found to have a large abdominal tumor. He is running at the Rainbow Bridge, pain free. 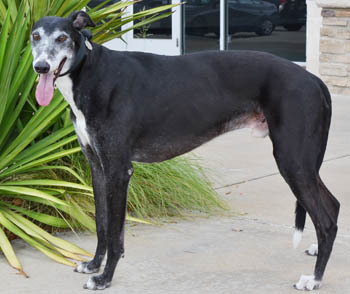 Blade is an 8-year-old black male born in April 2004. His ears are so dark, his full tattoos cannot be read. He arrived with Onyx as an owner surrender to a shelter. GALT eventually received 10 greyhounds from this same owner, the other eight being Carbon, Charity, Clooney, Cupcake, Harry, Stetson, Stewart, and Timex. It is almost certain that Blade and Onyx are siblings. Unfortunately, Blade, like the other nine, arrived heartworm positive, and with a heavy load of intestinal parasites. But this happy boy's long, 7-month journey back to health is now complete! Blade was much too interested in the cat - no kitties for Blade! Always happy, Blade is an absolute delight to have in the house. He loves to lie on a bed beside his foster brother and smile and then nap a bit and smile some more. He loves his toys and likes to keep a few scattered anyplace that he might be. Fortunately his foster brother couldn't care less about toys, so Blade is free to move the toys about as he sees fit. He has learned that laundry and towels are not toys. He loves to patrol the entire yard and to bark at shadows, possums, or unknown spirits that lurk in the night when he goes out for a late potty break. He is improving on the barking and he truly does his best to please me when I tell him "no". He won't take treats from my hand, but hugs and head scratches are very appreciated. Blade isn't a velcro dog. He is comfortable being by himself sometimes but is usually to be found with his foster brother, and I most often find the two of them in the same room with me. 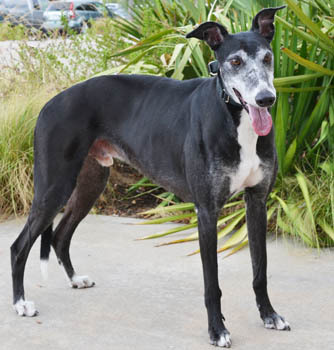 He loves walks and is learning that that is not the time to do the endearing greyhound "lean." It is an amazing talent to be able to lean on me and walk at the same time!! The white markings on his face look like a heart and make Blade "my funny Valentine." It is so hard to believe that he used to live in an enclosure with a pack without much human interaction. He is truly happy in the company of people, and of course dogs. I am delighted that he is finally ready to be adopted and be appreciated for being Blade the happy heart-faced dog.